Primed and ready to be your ideal home away from home, the West Port Residence is superbly central, wonderfully comfortable and delightfully classic. This 1 bedroom property in the absolute heart of the Old Town features a modern, airy decor and abundant light. Decorated in breezy simplicity, we guarantee you’ll be the envy of your friends if you book the West Port Residence for your next long weekend or business trip to Scotland’s historic capital. 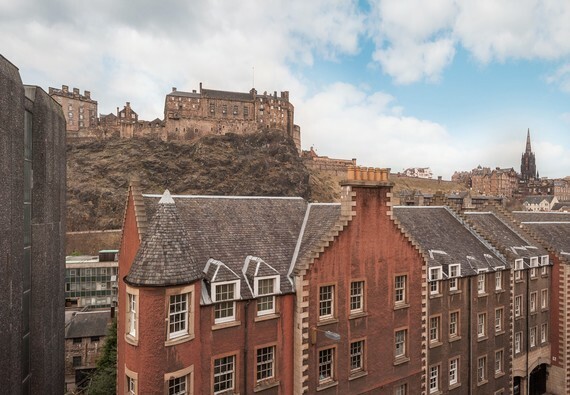 Absolutely brimming with charm and character, the West Port Residence even includes a balcony and access to a shared garden, so you’ll have plenty of places to relax and put your feet up... and yes, that is Edinburgh Castle you can see up close and personal from the alcove window. The West Port is a wonderfully spacious attic property, which allows for large windows and fantastic skylights. The lounge is light and airy - a breath of fresh air after a long day pounding the pavements! Sink into a delightfully squashy sofa and watch a good movie, or curl up in the adorable window alcove and lose yourself in a book. The open plan kitchen space is modern and versatile, featuring all the mod cons one would expect from a fabulous city centre property. There’s plenty of cooking space for you to whip up a feast, and a unique dining table and bench will seat 4 hungry guests. Whether you’re a whizz in the kitchen or a late night pizza orderer, we’ve got you covered. When it’s time to drift off to sweet dreams of your next adventure, the West Port Residence features 1 super comfy double bedroom. With access to the balcony, you’ll be able to take in the brisk Scottish morning air with ease! We recommend sipping a glass of wine and watching the sun dip over the city - a sight guaranteed to be remembered! Ample storage and a divinely comfortable bed means that a good night sleep will definitely be had by all! The lounge sofa also converts to a double sofa bed, to sleep 2 additional guests. Completing this property is a fresh, modern bathroom, with shower over bath, so whether you prefer a late night soak or an early morning shower, you’re well looked after at the West Port. If that isn’t enough for you, this property also includes a selection of DVDs for your viewing pleasure and an iPod dock, so you can have your own tunes on demand! The West Port Residence’s location is an absolute dream. Nestled on the edge of the Grassmarket, the local area is brimming with history and things to do. Whether you’d like to browse the varied boutiques on Cockburn Street or have a good old fashioned pub lunch while you gaze up at the Castle, this property has it all. The apartment itself is a grade C listed building, which occupies an ancient site within the World Heritage Trust area of Edinburgh's Old Town. The area is brimming with distinctive Scottish architecture and features one of only 2 known building emblems remaining in the Old Town. Princes Street is a mere 10 minute stroll away, and the Royal Mile is even closer. We guarantee that you’ll find intrigue galore on your doorstep - but if you’d like to venture further afield, Waverley train station is within easy walking distance and the area is well serviced by the extremely efficient Lothian Buses. No reviews yet for The West Port Castle View Residence.